For other uses, see Batavia (disambiguation). The establishment of Batavia at the site of the razed city of Jayakarta by the Dutch in 1619 led to the Dutch colony that became modern Indonesia following World War II. Batavia became the centre of the Dutch East India Company's trading network in Asia. Monopolies on local produce were augmented by non-indigenous cash crops. To safeguard their commercial interests, the company and the colonial administration progressively absorbed surrounding territory. Batavia lies on the north coast of Java, in a sheltered bay, over a flat land consisting of marshland and hills, and crisscrossed with canals. The city consisted of two centers: Oud Batavia, the oldest part of the city; and the relatively newer city located on the higher ground to the south. Batavia was a colonial city for about 320 years until 1942 when the Dutch East Indies fell under Japanese occupation during World War II. During the Japanese occupation and again after Indonesian nationalists declared independence on 17 August 1945, the city was renamed Jakarta. After the war, the city remained internationally recognised under its Dutch name, until full Indonesian independence was achieved in 1949, whereafter the city was renamed Jakarta. The Dutch government granted a monopoly on Asian trade with the Dutch East India Company in 1602. A year later, the first permanent Dutch trading post in Indonesia was established in Bantam, West Java. In 1610, Prince Jayawikarta granted permission to Dutch merchants to build a wooden godown and houses on the east bank of the Ciliwung River, opposite to Jayakarta. This outpost was established in 1611.:29 As Dutch power increased, Jayawikarta allowed the English to erect houses on the west bank of the Ciliwung River, as well as a fort close to his customs office post, to keep the forces balanced. Tense relations between Prince Jayawikarta and the Dutch escalated in 1618, and Jayawikarta's soldiers besieged the Dutch fortress, containing the godowns Nassau and Mauritius. An English fleet of 15 ships arrived under the leadership of Sir Thomas Dale, an English naval commander and former governor of the Colony of Virginia. After a sea battle, the newly appointed Dutch governor, Jan Pieterszoon Coen, escaped to the Moluccas to seek support. The Dutch had already taken over the first of the Portuguese forts there in 1605. Meanwhile, the commander of the Dutch garrison, Pieter van den Broecke, along with five other men, was arrested during negotiations, as Jayawikarta believed that he had been deceived by the Dutch. Later,[when?] Jayawikarta and the English entered into an alliance. The Dutch army was on the verge of surrendering to the English when, in 1619, Banten sent a group of soldiers to summon Prince Jayawikarta. Jayawikarta's friendship agreement with the English was without prior approval from the Bantenese authorities. The conflict between Banten and Prince Jayawikarta, as well as the tense relationship between Banten and the English, presented a new opportunity for the Dutch. Coen returned from the Moluccas with reinforcements on 28 May 1619 and razed Jayakarta to the ground on 30 May 1619,:35 thereby expelling its population. :50 Only the Luso-Sundanese padrão remained. Prince Jayawikarta retreated to Tanara, the eventual place of his death, in the interior of Banten. The Dutch established a closer relationship with Banten and assumed control of the port, which over time became the Dutch centre of power in the region. The area that became Batavia came under Dutch control in 1619, initially as an expansion of the original Dutch fort along with new building on the ruined area that had been Jayakarta. On 2 July 1619, Coen decided to expand the original fort into a larger fortress. Coen sent the draft of the Kasteel van Batavia to the Netherlands on 7 October 1619. This new castle was much larger than the previous castle, with two northern bastions protecting the castle from attack from the sea. The Dutch fortress garrison included hired soldiers from Japan, Germany, Scotland, Denmark and Belgium. The godowns Nassau and Mauritius were expanded with the erection of a new fort extension to the east on 12 March 1619, overseen by Commander Van Raay. Coen wished to name the new settlement "Nieuw-Hoorn" after his birthplace, Hoorn, but was prevented from doing so by the board of the East India Company, the Heeren XVII. "Batavia" was chosen to become the new name for the fort and settlement. The official naming ceremony took place on 18 January 1621. It was named after the Germanic tribe of the Batavi — the inhabitants of the Batavian region during the Roman period; at that time it was believed that the tribe's members were the ancestors of the Dutch people. Jayakarta was then called "Batavia" for more than 300 years. Batavia was founded as a trade and administrative centre of the Dutch East India Company; it was never intended to be a settlement for the Dutch people. Coen founded Batavia as a trading company, whereby a city's inhabitants would take care of the production and supply of food. As a result, there was no migration of Dutch families and, instead, a mixed society was formed. As the VOC preferred to maintain complete control over its business, a large number of slaves were employed. Batavia became an unattractive location for people who wanted to establish their own businesses. 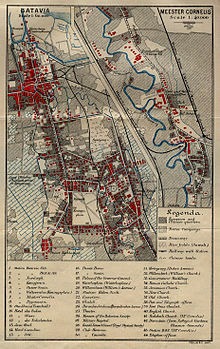 The Javanese people were prohibited from settling in Batavia from the time of its foundation in 1619,:194 as the Dutch feared an insurrection. Coen asked Willem Ysbrandtszoon Bontekoe, a skipper for the Dutch East India Company, to bring 1000 Chinese people to Batavia from Macao, but only a small number of the 1000 survived the trip. In 1621, another attempt was initiated and 15,000 people were deported from the Banda Islands to Batavia, but only 600 survived the trip. From the beginning of its establishment, Batavia was planned following a well-defined layout. In 1619, three trenches were dug to the east of the Ciliwung river, forming the first Dutch-made canals of Batavia. These three canals were named from south to north: Leeuwengracht, Groenegracht, and Steenhouwersgracht. The area of the Castle starts to the north of Steenhouwersgracht, which began with a field north of Steenhouwersgracht. A town's market was established on the field. The first church and town hall were built c.1622 on the east bank of the river; the exact point of this first building of the church-town hall of Batavia is at 6°07′56″S 106°48′42″E﻿ / ﻿6.132212°S 106.811779°E﻿ / -6.132212; 106.811779. This was replaced in the 1630s. Around 1627, the three canals were connected with each other with a new canal – the Tijgersgracht. The coconut-tree lined Tijgersgracht was among the most pleasant canals in the walled city of Batavia. A contemporary observer writes: "Among the Grachts, the Tygersgracht is the most stately and most pleasant, both for the goodliness of its buildings, and the ornamentation of its streets, which afford a very agreeable shadow to those who pass along the street". The Prinsestraat, which in the beginning formed the street that leads to the Castle, were established as an urban center, connecting the Castle south gate with the City Hall, forming an impressive vista on the seat of government. This eastern settlement of Batavia was protected by a long canal to the east of the settlement, forming a link between the castle moat and the Ciliwung river bend. This canal was not parallel with Tijgersgracht but slightly angled. The overall construction of the canal took more than 160,000 reals, which were paid not by the Company, but mainly by the Chinese and other Europeans; partly because the Company had spent for the strengthening of the Castle, which was done by slaves and prisoners. This short-lived outer canal was later redesigned a few years after the Siege of Batavia. Following the siege, it was decided that Batavia would need a stronger defence system. Based on the military defensive engineering ideas by Simon Stevin, a Flemish mathematician and military engineer, Governor-General Jacques Specx:463 designed a moat and city wall that surrounded the city; extensions of the city walls appeared to the west of Batavia and the city became completely enclosed. The city section within the defence lines was structured according to a grid plan, criss-crossed with canals that straightened the flow of the Ciliwung river. This area corresponds to present day Jakarta Old Town. In 1656, due to a conflict with Banten, the Javanese were not allowed to reside within the city walls and consequently settled outside Batavia. Only the Chinese people and the Mardijkers were allowed to settle within the walled city of Batavia. In 1659, a temporary peace with Banten enabled the city to grow and, during this period, more bamboo shacks appeared in Batavia. From 1667, bamboo houses, as well as the keeping of livestock, were banned within the city. Within Batavia's walls, the wealthy Dutch built tall houses and canals. As the city grew, the area outside the walls became an attraction for many people and suburbs began to develop outside the city walls. The Batavian hinterland's sugar industry deteriorated in the 1730s. :169:29 There were numerous unemployed people and growing social disorder. :169 In 1739, 10,574 registered Chinese were living in the Ommelanden. :53 Tensions grew as the colonial government attempted to restrict Chinese immigration by implementing deportations to Ceylon and South Africa. The Chinese became worried that they were to be thrown overboard to drown and riots erupted. :99 Ten thousand Chinese were massacred between 9 October 1740 and 22 October. During the following year, the few remaining Chinese inhabitants were moved to Glodok, outside the city walls. The area outside the walls was considered unsafe for the non-native inhabitants of Batavia. The area was an important source of food crops and building materials. The VOC set up a local government in 1664, but this only became fully functional in 1682.:10 The marsh area around Batavia could only be fully cultivated when a new peace treaty was signed with Banten in 1684. Country houses were subsequently established outside the city walls. The Chinese people began with the cultivation of sugarcane:6 and tuak, with coffee a later addition. After the Dutch East India Company went bankrupt and was dissolved in 1800, the Batavian Republic nationalized its debts and possessions, expanding all of the VOC's territorial claims into a fully-fledged colony named the Dutch East Indies. Batavia evolved from the site of the company's regional headquarters into the capital of the colony. In 1808, Daendels decided to quit the by-then dilapidated and unhealthy Old Town. A new town center was subsequently built further to the south by buying the estate of Weltevreden. 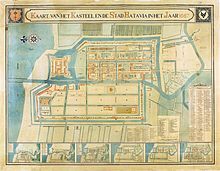 Batavia thereby became a city with two centers: Kota as the hub of business, where the offices and warehouses of shipping and trading companies were located; while Weltevreden became the new home for the government, military, and shops. These two centers were connected by the Molenvliet Canal and a road that ran alongside the waterway. During the British interregnum, Daendels was replaced by Stamford Raffles. :115–122:25 In 1811, Raffles – who was employed by the British East India company as Secretary to the Governor of Malacca – decided to take over the government in Batavia. Among the reason is to prevent the French from stepping in completely, as Napoleon had nominated Daendels who closely worked with the French. In 1816, the Dutch returned to rule the Dutch Indies. Europeans were brought to the archipelago to establish a colony on the unused land around the archipelago, causing wars in Java and Sumatra. Large numbers of military were brought into the Dutch Indies to suppress unrest, especially on Sumatra. The military was there also to extend the influence of Dutch government to outside Java. Despite this, the Dutch actually never conquered the whole archipelago. The development of the area of Weltevreden as the administrative center of the colony continued, gradually shifting the center of Batavia from Oud Batavia to the south. A new style of architecture emerged, known as Indies Empire style. White-plastered villas with a grand porch at the front were established especially around the Koningsplein and Weltevreden. Overall, this newer part of Batavia had more country-side looks than the built-up canaled city scape of Oud Batavia. The city beautification initiatives in Batavia during the period earns Batavia the nickname, "De Koningin van het Oosten", or "Queen of the East". Unlike the earlier half of the 19th-century, the latter half of the century was a peaceful period characterized by economic and technologic expansion and a stable government. In 1856, the first telegraph line was installed between Batavia and Buitenzorg. In 1859, Batavia was connected to Singapore, the first international telegraph connection in the Dutch East Indies. In 1861, Batavia completed its first gas works; by 1862, streets were lighted with gas lightings. Telephone lines were installed in 1882. A tramway was introduced to Batavia in 1869 as a horse-drawn tramway, which was upgraded to steam trams in 1882, and electric trams in 1900. Batavia's first railway started during the period in 1869, and the line from Batavia to Buitenzorg was finally completed in 1873. Ice works were first introduced to Batavia in 1870. The opening of the Suez Canal in 1869 increased the need for a new port. In 1885, the port of Tanjung Priok was finally completed, replacing the centuries-old Sunda Kelapa, which was deemed as inadequate for a long time. This then significantly increased commerce and tourism in Batavia and the Dutch East Indies in general. The Dutch cultuurstelsel, or cultivation system, was a Dutch government policy in the mid-nineteenth century which required a portion of agricultural production to be devoted to export crops. Indonesian historians refer to it as tanam paksa, enforced planting. The abolition of the cultuurstelsel in 1870 led to the rapid development of private enterprise in the Dutch Indies. Numerous trading companies and financial institutions established themselves in Java, with most settling in Batavia. Jakarta Old Town's deteriorating structures were replaced with offices, typically along the Kali Besar. These private companies owned or managed plantations, oil fields, or mines. The first railway line in Java was opened in 1867 and urban centers such as Batavia began to be equipped with railway stations. Many schools, hospitals, factories, offices, trading companies, and post offices were established throughout the city, while improvements in transportation, health, and technology in Batavia caused more and more Dutch people to migrate to the capital—the society of Batavia consequently became increasingly Dutch-like. International trade activity occurred with Europe and the increase of shipping led to the construction of a new harbor at Tanjung Priok between 1877 and 1883. The Dutch people who had never set foot on Batavia were known locally as Totoks. The term was also used to identify new Chinese arrivals, to differentiate them from the Peranakan. Many totoks developed a great love for the Indies culture of Indonesia and adopted this culture; they could be observed wearing kebayas, sarongs, as well as summer dresses. By the end of the 19th century, the population of the capital Batavian regency numbered 115,887 people, of which 8,893 were Europeans, 26,817 were Chinese and 77,700 were indigenous islanders. A significant consequence of these expanding commercial activities was the immigration of large numbers of Dutch employees, as well as rural Javanese, into Batavia. In 1905, the population of Batavia and the surrounding area reached 2.1 million, including 93,000 Chinese people, 14,000 Europeans, and 2,800 Arabs, in addition to the local population. This growth resulted in an increased demand for housing and land prices consequently soared. New houses were often built in dense arrangements and kampung settlements filled the spaces left in between the new structures. This settlements proceeded with little regard for the tropical conditions and resulted in overly dense living conditions, poor sanitation, and an absence of public amenities. In 1913, the plague broke out in Java. Also during the period, Old Batavia abandoned moats and ramparts experienced a new boom, as the commercial companies were re-established along the Kali Besar. In a very short period of time, the area of Old Batavia re-established itself as a new commercial center, with 20th-century and 17th-century buildings adjacent to each other. The University of Batavia was established in 1941 and later became the University of Indonesia. In 1946, the Dutch colonial government established the Nood Universiteit (Emergency University) in Jakarta. In 1947, the name was changed to Universiteit van Indonesië (UVI). Following the Indonesian National Revolution, the government established a state university in Jakarta in February 1950 named Universiteit Indonesia, comprising the BPTRI units and the former UVI. The name was later changed into Universitas Indonesia. Mohammad Husni Thamrin, a member of the Volksraad, criticized the colonial government for ignoring the development of kampung while catering for the rich people in Menteng. Thamrin also talked about the issue of Farming Tax and the other taxes that were burdensome for the poorer members of the community.In 1909, Tirtoadisurjo founded the Islamic Commercial Union in Batavia to support Indonesian merchants. Branches in other areas followed. In 1920, Tjokroaminoto and Agus Salim set up a committee in Batavia to support the Ottoman caliphate. In 1926, espionage warned the Dutch of a planned revolt and PKI leaders were arrested. Andries C. D. de Graeff replaced Fock as governor-general and uprisings in Batavia, Banten, and Priangan were quickly crushed. Armed Communists occupied the Batavia telephone exchange for one night before being captured. The Dutch sent prisoners to Banden and to a penal colony at Boven Digul in West New Guinea where many died of malaria. On 4 July 1927 Sukarno and the Study Club founded the Indonesian Nationalist Association which became the Indonesian Nationalist Party and later joined with the Partai Sarekat Islam, Budi Utomo, and the Surabaya Study Club to form the Union of Indonesian Political Associations. A youth congress was held in Batavia on October 1928 and the groups began referring to the city as Jakarta. They demanded Indonesian independence, displayed the red-and-white flag, and sang the Indonesian national anthem written by W. R. Supratman. The Dutch banned the flag, the national anthem, and the terms Indonesia and Indonesian. On 5 March 1942, Batavia fell to the Japanese. The Dutch formally surrendered to the Japanese occupation forces on 9 March 1942, and rule of the colony was transferred to Japan. The city was renamed Jakarta. The economic situation and the physical condition of Indonesian cities deteriorated during the occupation. Many buildings were vandalized, as metal was needed for the war, and many iron statues from the Dutch colonial period were taken away by the Japanese troops. Civil buildings were converted into internment camps where Dutch people were imprisoned. After the collapse of Japan in 1945, the area went through a period of transition and upheaval during the Indonesian national struggle for independence. During the Japanese occupation and from the perspective of the Indonesian nationalists who declared independence on 17 August 1945, the city was renamed Jakarta. In 1945, the city was briefly occupied by the Allies and then was returned to the Dutch. The Dutch name, Batavia, remained the internationally recognised name until full Indonesian independence was achieved and Jakarta was officially proclaimed the national capital on 27 December 1949. Batavia was founded as the trade and administrative centre of the Dutch East India Company; it was never intended to be a settlement for the Dutch people. Coen founded Batavia for trade, with the city's inhabitants taking care of the production and supply of food. As a result, there was no migration of intact Dutch families and there were few Dutch women in Batavia. A mixed society was formed, as relationships between Dutch men and Asian women did not usually result in marriage, and the women did not have the right of going with men who returned to the Dutch Republic. This societal pattern created a mixed group of mestizo descendants in Batavia. The sons of this mixed group often travelled to Europe to study, while the daughters were forced to remain in Batavia, with the latter often marrying Dutch East India Company officials at a very young age. As the VOC preferred to maintain complete control over its business, a large number of slaves was employed. Batavia became an unattractive location for people who wanted to establish their own businesses. The women in Batavia developed into an important feature of the social network of Batavia; they were accustomed to dealing with slaves and spoke the same language, mostly Portuguese and Malay. Eventually, many of these women effectively became widows, as their husbands left Batavia to return to the Netherlands, and their children were often removed as well. Most of Batavia's residents were of Asian descent. Thousands of slaves were brought from India and Arakan and, later, slaves were brought from Bali and Sulawesi. To avoid an uprising, a decision was made to free the Javanese people from slavery. Chinese people made up the largest group in Batavia, with most of them merchants and labourers. The Chinese people were the most decisive group in the development of Batavia. Additionally, there were also Malays, as well as Muslim and Hindu merchants from India. Initially, these different ethnic groups lived alongside each other; however, in 1688, complete segregation was enacted upon the indigenous population. Each ethnic group was forced to live in its own established village outside the city wall. There were Javanese villages for Javanese people, Moluccan villages for the Moluccans, and so on. Each person was tagged with a tag to identify them with their own ethnic group; later, this identity tag was replaced with a parchment. Reporting was compulsory for intermarriage that involved different ethnic groups. In the 18th century, Batavia became increasingly affected by malaria epidemics, as the marsh areas were breeding grounds for mosquitos. The disease killed many Europeans and Batavia received the nickname "cemetery of Europeans". Wealthier European settlers, who could afford relocation, moved to southern areas of higher elevation. :101 Eventually, the old city was dismantled in 1810. Within Batavia's walls, the wealthy Dutch built tall houses and canals. Commercial opportunities attracted Indonesian and especially Chinese immigrants, with the increasing population numbers creating a burden upon the city. In the 18th century, more than 60% of Batavia's population consisted of slaves working for the VOC. The slaves were mostly engaged to undertake housework, while working and living conditions were generally reasonable. Laws were enacted that protected slaves against overly cruel actions from their masters; for example, Christian slaves were given freedom after the death of their masters, while some slaves were allowed to own a store and make money to buy their freedom. Sometimes, slaves fled and established gangs that would roam throughout the area. Though from the beginning of the VOC establishment Batavia became the political and administrative centre of the Dutch East Indies as well as the major port in Southeast Asian trade, the population of the city proper remained relatively small. In the early 1800s, estimates of its population were still smaller than that of Surabaya, though it overtook that city by the end of that century: the first complete census survey of 1920 returned a population of 306,000, compared to 192,000 for Surabaya, 158,000 for Semarang and 134,000 for Surakarta. By then the population grew fast, as ten years later it exceeded half a million. The population of the Dutch Indies was never a purely European group. In 1860, within the 30,000 Dutch citizens in the entire Dutch Indies, only under 5000 were purely Dutch, the others being mixed descent. The gender percentage of the population is 70% male, 30% female as more male immigrants arrived from Europe. There were still slaves in Batavia until its abolition in 1853. Like previous period, slaves mostly lived in dwellings in the back of the garden of the main house. Slaves were employed by the master and were paid, given free food and lodging. The female slaves-employees, known as "baboe", did the cooking and took care of the children. Children went to school, but the teachers often only had a local background. Many children did not finish school at all. To counter this, the school system installed a set of prizes for well-performing children. During the period when Stamford Raffles became the Governor of Java, he changed the style of social interaction in the Batavian society. Raffles disapproved of the relaxed dress code of the Dutch where many men wore Javanese attire. Raffles and his wife Olivia introduced the custom of wearing a European style of dress, but with much white because of the tropical climate, in both men and women. When the British left Batavia in 1815, most of the native people reverted to their original Javanese attire, but some of these new aspects persisted. The native males that were chosen to be the governing elite wore a European outfit on duty, but after hours they would change to wearing sarong and kebaya. Lower-ranked Dutchmen might use the local style all day. Women wore sarongs and kebaya even to official events, where they would wear tighter fitting robes or richly coloured or flowered cloth in the style of British India, and batik shawls. ^ de Haan 1922, pp. 44–5. ^ a b c "Batavia". De VOCsite (in Dutch). de VOCsite. 2002–2012. Retrieved 27 November 2012. ^ "Jan Pieterszoon Coen (1587–1629) – Stichter van Batavia". Historiek. 21 August 2015. ^ a b c de Haan 1922, pp. 46–7. ^ a b Bollee, Kaart van Batavia 1667. ^ a b c de Haan 1922, pp. 46-7. ^ Gunawan Tjahjono 1998, p. 113. ^ Indonesia. Lonely Planet. 2007. p. 101. ISBN 9781741798456. ^ Blussé, L. Strange Company. Chinese settlers, mestizo women and the Dutch in VOC Batavia. Dordrecht: Floris Publication, 1986. ^ Mulyawan Karim 2009, pp. 91–2. ^ de Haan 1922, p. 469. ^ a b c d Gunawan Tjahjono 1998, p. 109. ^ National Information Agency. Indonesia 2004; an official handbook. Republic of Indonesia. ^ a b c d "Batavia in the 19th century". Argelander-Institut für Astronomie. Universität Bonn. June 23, 2014. Retrieved April 24, 2017. ^ de Jong 1998, p. 257. ^ a b c d Merrillees 2001, p. 14. ^ Gunawan Tjahjono 1998, p. 116. ^ Teeuwen, Dirk (2007). Landing stages of Jakarta/Batavia. ^ Nordholt, Henk Schulte; M Imam Aziz (2005). Outward appearances: trend, identitas, kepentingan (in Indonesian). PT LKiS Pelangi Aksara. p. 227. ISBN 9789799492951. ^ van Emden,, F. J. G.; W. S. B. Klooster (1964). Willem Brandt (ed.). Kleurig memoriaal van de Hollanders op Oud-Java. A. J. G. Strengholt. ^ de Jong 1998, p. 258. ^ de Jong 1998, p. 259.
de Haan, F. (1922). Oud Batavia. 1. Batavia: G. Kolff & Co, Koninklijk Bataviaasch Genootschap van Kunsten en Wetenschappen. Gunawan Tjahjono, ed. (1998). Architecture. Indonesian Heritage. 6. Singapore: Archipelago Press. ISBN 981-3018-30-5. Kaart van het Kasteel en de Stad Batavia in het Jaar 1667 [Map of the Castle and the City Batavia in year 1667] (Map) (Den Haag ed.). 50 rhijnlandsche roeden (in Dutch). Cartography by J.J. Bollee. G.B. Hooyer and J.W. Yzerman. 1919. Merrillees, Scott (2001). Batavia in Nineteenth Century Photographs. Singapore: Editions Didier Millet. ISBN 9789813018778. Mulyawan Karim, ed. (2009). Ekspedisi Ciliwung, Laporan Jurnalistik Kompas, Mata Air – Air Mata. Jakarta: PT. Kompas Media Nusantara. ISBN 978-9797094256.